This review is of the cut shown at the BFI London Film Festival in October 2017 – the UK release date is currently listed for November 24th 2017. The 1973 exhibition tennis match between Billie Jean King and Bobby Riggs is a cornerstone in modern appreciation of female tennis players, but despite the match being dubbed “Battle of the Sexes” in the media, the title as applied here actually doesn’t reference that at all, even though it is a major part of the film’s plot. Instead, the “Battle of the Sexes” refers to something much worse and far too common even in this day and age, and that’s just the casual sexism experienced by women in a male-dominated industry, and how someone like King fought the acceptable chauvinism in any way that she could – it is a very literal battle of the sexes, and one that we really need in our culture right now, what with sexism still running rampant and numerous allegations of sexual abuse and harassment by noted male figures in several industries. Luckily, this film is exactly the kind of empowering and provocative movie that we so desperately need, and it tackles this difficult topic with a huge amount of fun that makes it incredibly entertaining to watch. It begins as Billie Jean King (Emma Stone) is on the top of the world as the number one female tennis player, with success after success coming her way thanks to her natural abilities on the tennis court, but when she discovers that the Association of Tennis Professionals are paying her eight times less than her male counterparts, on account of the female “biology” as the stuffy men in armchairs so casually put it (among them Bill Pullman’s smug and smarmy commentator Jack Kramer), she founds the Women’s Tennis Association and recruits several female players to partake in a push for gender equality in the sport. Meanwhile, former world champion Bobby Riggs (Steve Carell) is eager to get back into the spotlight, and pitches to an unconvinced King an exhibition match that pits, in his words, a “male chauvinist pig versus a hairy-legged feminist”, but it’s not until King and other female players face more and more humiliation that she finally decides to take Riggs up on his offer, and soon the match, which sees the winner receive a $100,000 prize, is on. In the hands of another director or screenwriter, the film would solely focus on the match itself, and everything that led up to it, but directors Jonathan Dayton and Valerie Faris, and writer Simon Beaufoy, wisely don’t let the match take centre stage until the third act of the film. Everything else up until then focuses on the lives of these two very different tennis players, and the difficulties they faced in their personal lives, especially King who aside from fighting to have her gender taken seriously in the sport is also fighting her own feelings for other women, represented in the form of hairdresser Marilyn Barnett (Andrea Riseborough) whom King becomes increasingly attracted to, despite being a married woman. Riggs, meanwhile, is a pathetic clown who is stuck in a dull office job and lives with his increasingly frustrated wife (Elisabeth Shue), while also suffering from a gambling addiction that just makes him pine for the glory days all the more, and in his return to the spotlight adopts such a chauvinist public attitude that he soon becomes a mouthpiece for all the top figures who similarly don’t want to see women be seen as equal to men. You know, just typing that last sentence really makes me think about how timely this story actually is, because sexism is still very sadly around and women are still not being given fair opportunities to progress the same as men are, in any male-dominated industry. What this movie highlights so well is how not much has really changed since the early 70s in terms of industrial sexism, and in this day and age this kind of prejudice and abuse of power can have such a negative impact on its overall image. That’s why Riggs really isn’t the villain here; he’s just a product of the times, enabled by men who are actively trying to put female players down in any way they can, and King’s eventual challenging of Riggs to the climactic match is seen as a major milestone in not just tennis, but in overall acceptance that women can do exactly what men can do, and often do it even better. Dayton and Faris and Beaufoy both bring a sensible mood to their respective direction and writing, while also going all out in showing the ridiculousness of it all, especially as Carell’s Riggs is showboating to no end while Stone’s King is doing it for a much bigger cause. Both actors are on top here, with Carell giving a soul to the goofiness his larger-than-life character exhales, and Stone especially standing out in a touching and perky performance as someone who grows to be unafraid of who they are to themselves, whilst fighting for the sake of her female brethren. Even though the result of the match itself is hardly a secret to anyone that follows tennis history, Battle of the Sexes is still a fun ride that takes you through a rough journey of casual sexism which disappointingly really hasn’t progressed much since the 1970s, but climaxes in a heart-beating showdown that makes for a fitting end to a pretty entertaining time. 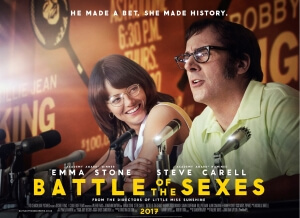 Battle of the Sexes is a humbling reminder that casual sexism in most industries, in this case tennis, really hasn’t changed that much since the 1970s, but it is also an entertaining experience that’s bolstered by fun performances by Steve Carell and Emma Stone, the latter of whom really shines as the great Billie Jean King.